Crassula perfoliata, also known as Crassula falcata, is given the common names 'airplane plant' and 'propeller plant' (because of the fanciful resemblance of the leaves to propellers). 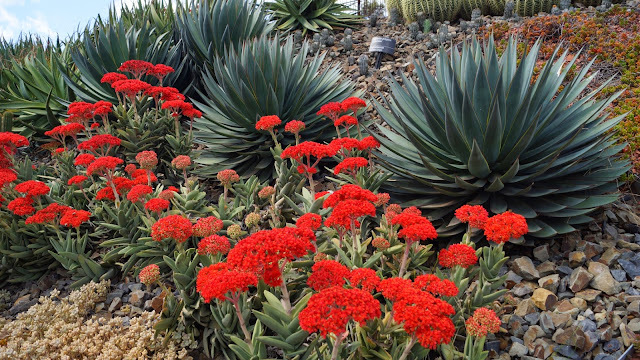 It is a succulent plant endemic to South Africa, from the Cape of Good Hope. The foliage is gray-green with striking texture, on plants that grow to 0.61 m tall. The flowers are tiny and scarlet red, that rise in dense clusters above the foliage for a month in summer. This is a choice plant for use in drought tolerant and succulent gardens, and in container gardens. This plant flowers during summer (November to February). Plants are pollinated by butterflies and the seeds are dispersed by the wind. The plants grow on outcrops and ledges in full sun. Plants are initially solitary but may sometimes have up to three heads later. During wet conditions the leaves become very turgid and during dry spells they become flattened and tinged reddish. It grows easily and is best planted on rockeries in full sunlight. It would be excellent for dry thicket gardens. In regions where frost is experienced, it is best grown in containers in a greenhouse, or on windowsills under controlled conditions. Propagation is easily effected by division, leaf cuttings or seed. Seed germinates within 3 weeks and plants should flower in the fourth year. Leaf cuttings can be made during spring or summer and rooted in clean sand. They must be kept moist. Sulphur should be applied as a fungicide to wounds. A lovely addition to any rock garden!